You are currently browsing the category archive for the ‘Viking Folklore’ category. IF THE Lay of Eric was “made to order” by an unknown poet, as the eulogium of an unpopular, though brave, king, the Lay of Hákon is composed by the best-known of Norwegian skalds, unquestionably of his own accord, to commemorate his generally beloved leader. Hence the warmth of feeling, the note of personal loss, which pervades this splendid poem. Hákon, surnamed the Good, a child of Harold Hairfair’s old age, had been fostered by King Æthelstan of England, and thus brought up a Christian. After overthrowing his half brother Eric he tried to introduce the new faith, but met with stubborn opposition and had to desist in order to keep his throne. He is described as an ideal ruler for the times, handsome, generous, warlike though not aggressive, during whose reign of twenty-six years Norway enjoyed comparative peace and good harvests. He repelled several attempts of the sons of Eric to repossess themselves of the kingdom with the help of the Danes, but was wounded in a (victorious) battle against them on the island of Storth in southwest Norway (961) and died soon thereafter. The poet Eyvind Finnsson was himself a distant relative of the king. We know that he lived in moderate circumstances and was a man of character. His (much-debated) epithet of skáldaspillir seems to mean “despoiler of skalds”; and if so, must have been given him by his enemies who readily fastened on the fact that his best works, Hákonarmól and Háleygiatal—the latter a long genealogical poem—are quite evidently patterned, the one after Eiriksmól, the other, after Ynglingatal, by the earlier poet, Thióthólf of Hvin. If, notwithstanding this lack of original inspiration, the Lay of Hákon has been generally admired, then as well as now, this is due, not only to the genuine warmth and sincerity, but also to the superior artistry which makes it, all in all, perhaps the finest monument of its kind erected by Northern antiquity. Central, and similar down to details, in both Eiriksmól and Hákonarmól, is the hero-king’s advent in Valholl; but whereas the former does not change scene (and thus achieves greater unity) the latter, with richer content, shifts from earth to heaven and back again to earth as it ebbs in the poet’s plaint over the loss of the peerless king. Also in style Hákonarmól shows more variety—consciously striven for. Thus, the straightforward and sober style of the narrative stanzas contrasts with the typically skaldic, baroque overloading of the battle-scene, clamorous with gorgeous and bizarre kennings, and that again with the highly charged dramatic force of the dialogues and the elegiac sorrow of the final dirge. The meter likewise shows a carefully considered correspondence to the style and theme—simple, impressive lióthaháttr for the epic-dramatic and lyric portions, against the martial tramp and blare of málaháttr descriptive of the carnage. Eyvind had no doubt both a political and an apologetic aim with his poem: it was to be a counterblast to Eiriksmól and outdo it in splendor, but also to save the king’s good heathen reputation. If Hákon at his entrance in Valholl is suspicious of Óthin’s attitude and refuses to abandon his arms, he has abundant cause to fear the god’s wrath—his abortive defection from the heathen cause. And the good reception accorded him because he had “protected” the heathen fanes which, in fact, he had been powerless to destroy, may not have been altogether convincing to his contemporaries.1 Also the heathen trappings, the copious reminiscences from such arch heathen poems as Voluspó and Hóvamól, the interest in the king shown by the valkyries, the delegation to receive him composed of the gods Bragi and Hermóth—the same who was to fetch Baldr back from Hel2—all seem deliberately chosen to link the king with the old religion and to rehabilitate him in the eyes of his people. The complete poem is found in Snorri Sturlason’s History of the Norwegian Kings (Heimskringla), at the end of Hákonarsaga gótha. Portions of it are transmitted also in Fagrskinna. 1 Gautatýr3 sent forth Gondul and Skogul4 to choose among kings’ kinsmen: who of Yngvi’s offspring5 should with Óthin dwell,and wend with him to Valholl. 2 They found Biorn’s brother6 his byrnie donning, under standard standing the stalwart leader—were darts uplifted and spearshafts lowered; up the strife then started. 4 Threw down his war-weeds, thrust off his byrnie9 the great-hearted lord, ere began the battle—laughed with his liege-men; his land would he shield now,10 the gladsome hero ’neath old-helm standing. 5 Cut then keenly the king’s broadsword through foemen’s war-weeds, as though water it sundered.11 Clashed then spear-blades, cleft were war-shields; did ring-decked12 war-swords rattle on helmets. 7 Burned the wound-fires16 in bloody gashes, were the long-beards17 lifted against the life of warriors—the sea-of-wounds18 surged high around the swords’ edges,ran the stream-of-arrows18 on the strand of Storth-isle. 8 Reddened war-shields rang ’gainst each other, did Skogul’s-stormblasts19 scar red targes; billowed blood-waves in the blast-of-Óthin20—was many a man’s son mowed down in battle. 9 Sate21 then the liege-lords with swords brandished, with shields shattered and shredded byrnies: not happy in their hearts was that host of men, and to Valholl wended their way. 11 Heard the war-lord what the valkyries spoke of, high-hearted, on horsehack—wisely they bore them, sitting war- helmeted, and with shields them sheltering. 13 “ ’Tis owing to us that the issue was won and your foemen did flee. 17 “All einheriar shall swear oaths to thee: share thou the æsir’s ale, thou enemy-of-earls!25 Here within hast thou brethren eight,” said Bragi. 19 Then was it seen how that sea-king had upheld the holy altars, since Hákon all did hail with welcome, both gods and heavenly hosts. 1 Though we may in this stanza also see a reflection on his successors who ravaged the sanctuaries and hid the gold. 3 “The God of the Gauts.” i.e., Óthin. 5 Yngvi generally stands for Freyr in his capacity of progenitor of the Swedish kings. Here, however, he stands for Óthin, the progenitor of the royal race of Norway. 6 Hákon. Biorn was one of the many sons of Harold Fairhair. 7 Cf. Haraldskvæthi, note 37. Horthaland is here substituted for the Rogaland of the text. It is directly south of the latter. 9 This was not uncommon with fierce warriors, in the heat of battle. 10 Viz., against the sons of Eric. 11 At his departure from England, his foster father, King Æthelstan, gave him the sword Quernbiter with which Hákon is said to have cut a millstone in two. 12 Swords frequently had rings on the hilt, for carrying. 13 The following stanzas are examples of Skaldic style overloaded with kennings; though not as complicated and disjointed as was believed until recently. The Týr (god)-of-shields (or rings) is a kenning for “warrior.” In ordinary language the first part of the stanza says that the shields and the heads of Northmen were trodden (hewed) by the hardened steel of the king (Kock). 15 The serried shields thrown about the king. 19 I.e., the mutual attacks. The difficulties, both of interpretation and translation, are considerable. 22 Cf. Eiriksmól, 7, note, for the conception implied. 24 “God of gods,” i.e., Óthin. 26 Cf. Hovamól, 1. I follow Kock’s suggestion. 27 There is reference here, probably, to his favor with the gods, manifest in good harvests and general prosperity. 28 Cf. Voluspó 36, 54: not till the end of the world will a better ruler come. 29 Patently, a reminiscence of the famous stanzas 77, 78 of Hóvamól. 30 This is, very likely, an allusion to the lawless times that followed the reign of Hákon. 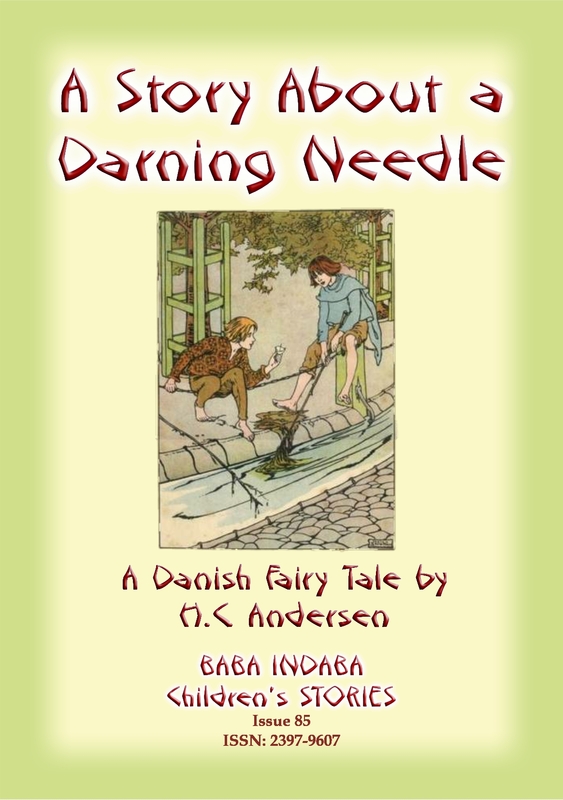 In Issue 41 of the Baba Indaba Children’s Stories, Baba Indaba narrates the Norse legend of The Wind Rider – A long, time ago, in a land far, far away, a magician was once upon a time much put out with a young countryman. In a fit of rage and spite he curses the young man to ride the wind of the storm for seven years. But these things have a way of backfiring on those with evil intent. Read the story to find out what happens.